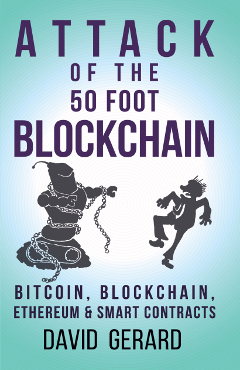 Winifred Poster at Washington University in St. Louis is running a “Virtual Money” course, featuring Attack of the 50 Foot Blockchain as a course text. Winifred asked if I’d speak to the class over Skype. I didn’t have Internet at home that week due to the house move — and it still isn’t on — so I prerecorded a video for them. With their permission, I’ve put the video up. Recorded Tuesday 2 October 2018, shown to the class Wednesday 3 October 2018. So if you’d like one of these, or a live Skype session — just set the book, and email me to ask! Video is Rose‘s 4:3 laptop webcam, on the HP Envy laptop she got from Tanya dePass. Sound is my Jabra Evolve 30 II UC Stereo headset (£50 UK, or $60 US) with compression afterwards. My shirt is Celtic Stag by Rose. Here are the student questions I read out in the video — pretty much about the basics of Bitcoin and cryptos. Bitcoin was originally proposed as a non-state currency. How can it be used as a currency when it can’t maintain a stable value? The benefit of a currency is that all parties can be reasonably confident in the value exchanged, and yet Bitcoin doesn’t yet achieve anywhere near that stability. If cryptocurrency doesn’t pan out as a viable currency, do you expect the blockchain technology to be used for other applications such as contracts? How susceptible do you think cryptocurrencies are to hacking? Are there recommended steps to prevent theft? 1. Bitcoin believers say that because a limited number of Bitcoins exist, the market price will stay high. But new crypto-currencies are entering the crypto-market all the time. In what ways does the increasing variety of crypto-currencies affect the market value of Bitcoin and other crypto-currencies? 2. People are not only buying Bitcoin, but creating new businesses from the ground up based entirely on Bitcoin, such as some friends of mine who founded a travel company called Winding Tree that uses Bitcoin to bypass centralized travel platforms like Expedia. Clearly, you are skeptical of the real value of crypto-currencies, but what kind of fallout do you foresee with such businesses when these magical Internet monies finally bottom out? 3. Secondly, how would you compare a crypto-crash against an economic crash like the 2008 Recession? 1) Why store Bitcoin in exchanges if the value of Bitcoin is so volatile? 2) What is the incentive to sell Bitcoin at any one point, unless the assumption that there is a set number of Bitcoin (21 million) unrealistic? 3) If the point of Bitcoin is to eventually exchange for usable money, why do some Bitcoin users “root for” economic downturns? 1. Because advocates of bitcoin believe that eventually this system will be the saving grace of the economy, is there a conversation happening on educating society about cryptocurrency? Do they believe it will happen organically? 2. What does the value of bitcoin depend on, and who makes the ever-changing values known? 1. 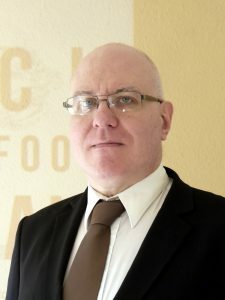 What are the biggest challenges of a non-state system like Bitcoin? What if your wallet gets hacked? How can Bitcoin users protect their assets from hackers? 2. There are many third-party apps or platforms that interact with the cryptocurrency ecosystem such as digital wallets and digital trading companies. How do these systems provide some type of deposit insurance or a mechanism that will make Bitcoin users trust that their assets will be safe when going through their platforms? 3. What are the BitLicense regulations? 4. If money cannot work without the technological and regulatory infrastructure enabling it, who states the regulations for Bitcoin and other cryptocurrencies? 5. What other types of cryptocurrencies exist apart from Bitcoin? What is the difference between them? Why is Bitcoin the most widely known cryptocurrency? 6. It is the year 2050, how do you see what the world will be like after the cryptocurrencies have been around for over 40 years? 7. How can the Blockchain technology help empower Puerto Ricans to rebuild the island after the economic depression and the aftermath of Hurricane María? What would it mean for Puerto Rico to become a Crypto Utopia? What would be the benefits and how do you achieve that? 1. Shouldn’t the law of diminishing returns push even the most resource-rich miners out of the business quickly? 2. If so, how can Nakamoto expect to reach the 21 million limit? 3. If they do not and instead expect there to always be room to grow (with the 21 million being an eventual, theoretical maximum), doesn’t this create inflationary conditions that undermine one of the core arguments for bitcoin (i.e. : that it cannot devalue through inflation because there is a set amount that can exist)? I wonder if it is naïve for one to be attracted by the concept of crypto currencies or if indeed, it is truly a valid concept to be take seriously, one in its early infancy experiencing growing pains not comprehended by the unsophisticated and those with lack of vision?